easy canned button mushroom curry with gravy. 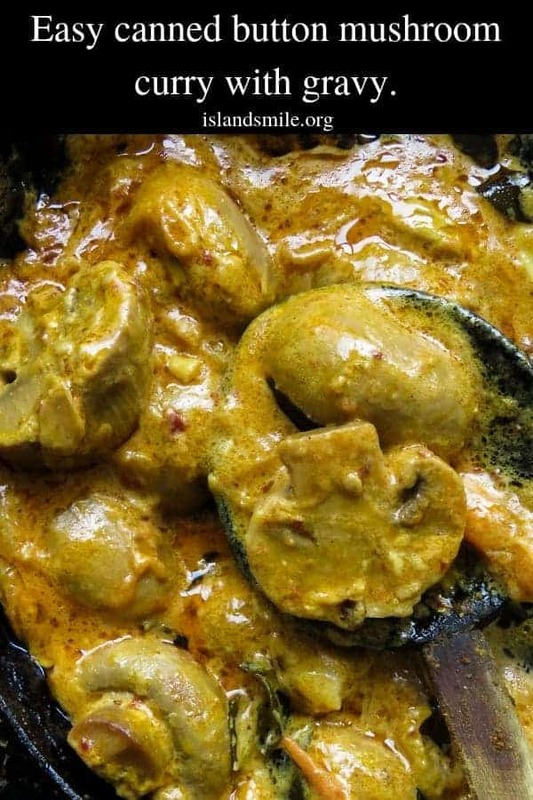 Here’s a mushroom curry recipe for all ages and diets. It’s easy to make, uses Sri Lankan spices. Have a can of button mushrooms in your pantry? If you do then you are in for a real treat with this delicious button mushroom curry with a hint of Sri Lankan taste to elevate the dish. This quick mushroom curry was a part of clearing up my pantry and trying to create a quick meal at the same time. A mushroom curry even the kids will love. Given how easy and quick the mushroom curry took to make, I was pleasantly surprised to find how much my kids loved it as well. Since I had only one can in hand and four kids to share it with, well let’s just say there was a lot of arguing over who gets how many button mushrooms in their plates, the only time this ever happens is when there’s a delicious chicken or meat dish involved. Promising to pick up more canned button mushrooms to satisfy their craving. And since they liked it so much, I decided to skip all the other recipe post scheduled to be written, I wrote this mushroom coconut curry recipe. If my fussy kids(7-18) love the mushroom curry, I‘m sure your kids are going to love it too. Mushrooms with their earthy texture can be a great option for your meatless meals especially if you cook them as they are, a perfect example is this creamy mushroom curry. When you cut them in half instead of the usual way of slicing them thin. The thick gravy and the chunky feel of the mushroom make them almost feel and taste like meat. 1/ Imagine this thick curry, topped over toast with a few more condiments like crunchy onions, tomatoes, even a crispy fried egg. 2/ Reduce the gravy, turn the mushroom curry into a dry dish, add a few chopped onions, tomatoes to a flatbread, cheese it and you have an instant pizza. 3/ Add this kid-friendly curry into your rice and curry menu. Can I use fresh button mushrooms? Honestly, I have no idea, you might be able to make the same mushroom curry but there might be a change in taste. I would suggest only using button mushrooms for the recipe. You can use any type of cooking cream out there, a tablespoon or two would do. But I find using coconut milk and reducing into a thick consistency is how you make a good mushroom gravy. All you need to make this quick dish is your favourite skillet or a medium-sized pan. Open the can of mushrooms, drain and cut each mushroom into two. Place a pan or skillet over medium heat. Pour in the oil and gradually add curry leaves, onions, garlic, cardamom into the pan. Cook the ingredients until the onions turn brown on the edges. 3-5 minutes. Add the mushrooms into the pan and cook them until they turn golden brown. 5 minutes. Add in the turmeric powder, curry powder and chilli powder, combine with the mushrooms and cook for a few minutes(3 minutes). Finally add tomatoes and tomato sauce, season with salt and continue to brown the mushrooms over medium heat. Pour in the coconut milk and slow simmer until you have a thick gravy. Other mushroom recipes you might like. EASY CANNED BUTTON MUSHROOM CURRY WITH GRAVY USING CANNED MUSHROOMS, SRI LANKAN SPICES, YOU CAN CREATE THIS EASY VEGETARIAN DISH GUARANTEED TO SATISFY KIDS OF ALL AGES. ﻿Pour in the coconut milk and slow simmer until you have a thick gravy.